I must admit I have a problem. 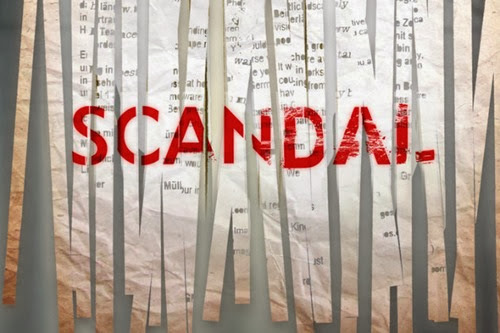 I am entirely addicted to watching Scandal. I can’t stop! I’m about 3/4 of the way through Season 2 right now. When I’m not watching, I’m thinking about the show, reading recaps, and narrowly avoiding spoilers – which is not easy when you’re watching a show after most of the world. I love the chemistry between Fitz and Olivia, but I know Fitz can be a jerk too, so my feelings for them as a couple are starting to tear just a bit. If you want to tell me to hold on and trust in them, you can, but please no spoilers! 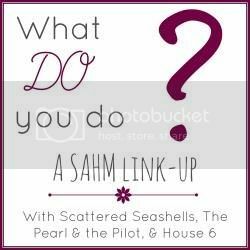 As much as I’d love to write more about Scandal, today I’m actually linking up with Chantal for her SAHM Link-Up! What is your typical daily routine/schedule like? I get up with the big kids and make sure they get dressed and I give them breakfast. They leave at 7:30 and then I eat my breakfast and have my coffee and get myself and Simon dressed and ready to go. He starts school at 9 so on most days I bring him and from there go do any errands I need to do. I try to have some time to myself at home before I pick up Simon at 12:30. I usually drive at least one of Simon’s friends home, plus 3 days a week I have one of his friends over for a bit. After that we hang out, watch TV, etc., until it’s either time to get Zachary, both kids come home, or its time to get both of them. (My carpool schedule is a bit crazy because Gabbie gets out of school later than Zachary twice a week.) When the big kids get home I help them with homework and make their lunches for the next day. When Dave gets home I go to the gym for an hour and then we eat dinner. The kids get ready for bed and the boys go to bed around 7:30 or 7:45. Gabbie stays up a bit later than that and I take a shower either while she’s using my computer or after she goes to bed. Then I watch TV, catch up on blogs, knit, etc., until sometime after 11 PM, when I get into bed and read until I’m tired enough to fall asleep. What things do you do weekly/monthly in addition to daily? Each day is different based on the kids’ schedules. I don’t have a scheduled day that I do grocery shopping but I am usually at some store or another weekly. On Fridays I tend to do more of the cooking, depending if we are having guests over for Saturday lunch or otherwise. I do all my laundry on Sundays but I’m wanting to change that routine because I feel it is making me stressed when I prefer Sundays to be fun days! How does your spouse’s schedule impact your daily routine? Like I said, I go to the gym when Dave gets home from work. Dave travels for work relatively often and that always disrupts my schedule. I depend on having him around for dinner time and bedtime! How do you balance having a clean home and making memories with your children? I tend to let the cleaning go. Which is why we have a cleaning lady. She comes every other week. Since Simon is now in school every day, we were supposed to stop having her come and start having me do all the cleaning, but when Dave traveled 4 out of 5 weeks last month I decided I deserve a cleaning lady! I know I’m lucky and I’m thankful! One last thing I wanted to share today is this “Happiness Generator.” We all need some happy pick-me-ups some times, right? Click image to open interactive version (via Two Little Fleas).